Work in progress for obvious reasons. 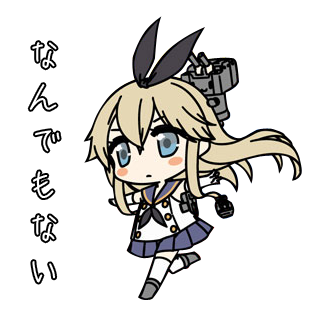 And the teitoku trend continues. This album is interesting because four of the tracks are original compositions and the lyrics in general are all pretty amusing. Saraba Manshin is a dramatic tale of the teitoku journey from cat screen to compass-chan to spending food money on the game; Boku no Himawari is an original composition themed around Mogami’s desire for Hyuuga’s affection; Omohide Haruharu (title parodying the Ghibli film Omohide Poroporo, known in English as Only Yesterday) is another original one themed around Haruna; 321 Daisakusen! is yet another original one, this time talking about how even though kanmusu are so cute, as a responsible teitoku you must hold back your carnal desires… not that doujinshi ever follow that rule. Yasen Shiyo! is the final original piece, themed around Sendai. There’s even easy listening and jazz Kancolle! Not really my style… I just thought it was amusing. Seems to be lacking one of those “epic” tracks (e.g. LiveActors, Three Magic/Brilliant Colors remixes) but who knows; I might change my mind on that after properly listening to the songs (that happens a lot). Double Dealing Character music is rolling in… I still haven’t familiarized myself with anything from the game at all. (；・∀・) Took a quick glance at characters and it seems to be musical instruments with a touch of mermaid and werewolf. OK.
Love that Merami and 3L.